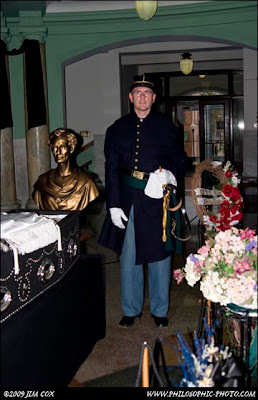 I mention in the previous post that Rockport, Indiana (in the county where Abraham Lincoln grew) marked the 144th anniversary of Abraham Lincoln's assassination by displaying a replica of Lincoln's coffin in its courthouse. 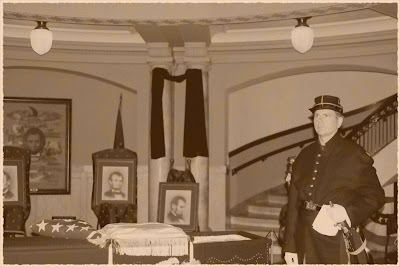 The ornate coffin is displayed at the Spencer County Courthouse, 144 years after Lincoln was mortally wounded at Ford's Theater. He died the morning after the shooting. Here is our own Sir James of Taylor keeping watch over the coffin as it lays in state in the courthouse.